(a) Program of Instruction. The program of instruction is the detailed step by step set up of directions which tell the machine tool what to do and in what sequence. It is coded in numerical or symbolic form or some type of input medium that can be interrupted by the controller unit. The most common input medium today is punched tape. Over the years, other forms of input medium have been used, including punched cards, magnetic tape, and even 35 mm motion picture film. There are two other methods of input to the NC system which should be mentioned. The first method is by manual entry of instruction data to the controller unit. This method is called manual data input (MDI) and is appropriate only for relatively simple jobs where the order will not be repeated. The second method of input is by means of a direct link with a computer. 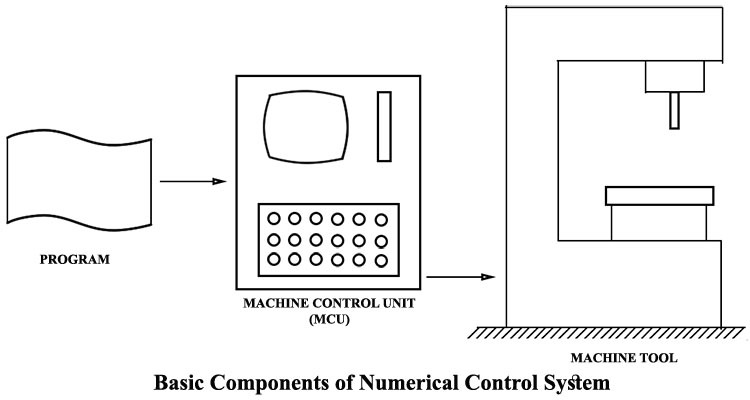 This is called direct numerical control (DNC). (b) Controller Unit Also Called Machine Control Unit (MCU). The second basic component of the NC system is the controller unit. This consists of the electronics and hardware that read and interpret the program of instructions and convert it into mechanical actions of the machine tool. The typical elements of a conventional NC controller unit include the tape reader, a data buffer, signal output channels to the machine too feedback channels from the machine tool, and the sequence controls to coordinate the overall operation of the forgoing elements. It should be noted that nearly all modern NC system are sold with a microcomputer as the controller unit. (c) Machine Tool or Other Controlled Equipment. The third basic component of an NC system is the machine tool or other controlled process. It is the part of the NC system which performs useful work. In the most common example of an NC system, one designed to perform machining operations, the machine tool consists of the work table and spindle as well as the motors and controls necessary to drive them. It also includes the cutting tolls, work fixtures and other auxiliary equipment needed in the machining operation.